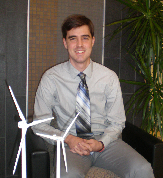 Eric Ritter is the Communications and Strategy Manager for the Lake Erie Energy Development Corporation (LEEDCo). He is primarily responsible for managing LEEDCo’s outreach activities to help educate the public, engage key stakeholders, secure permits, attract investors and sell power for the Icebreaker offshore wind project. He has given presentations to dozens of organizations including environmental groups, community groups and many others. He created the POWER Pledge and led a door-to-door outreach campaign in 2013 that demonstrated overwhelming support for LEEDCo’s vision of a new offshore wind industry in the Great Lakes. Before joining the LEEDCo team in 2012, Eric graduated from the University of California, Berkeley with a degree in history and public policy, and then worked for six years as an outreach consultant and campaign director for a variety of environmental, social justice, and political causes.